This hostel was awesome and spacious! The location was great and right next to tons of delicious food! Most of the staff was incredibly helpful and accommodating. Very Cute Hostel ! Loved everything about it . 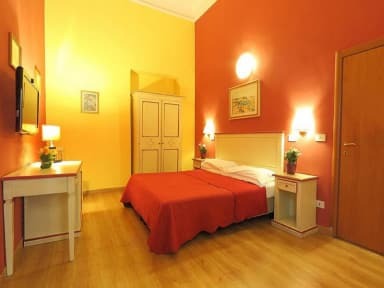 Our room was clean, staff was kind and breakfast only 5 euros per person. Thanks ! Fantastic deal ! Very cheap hotel and excellent location ! Very cool family Hotel with large rooms and very good staff. i got there late at night and i i was able to check in and have a beer at their tiny bar . Location was perfect, only a 12 minutes walk to the cathedral and the cleanliness of this place was great ! Deberían tener una score mas alto pero lo cierto es que este no es un hostal así que no tendrás las misma experiencia. Los cuartos eran muy grandes y bastante agradables. It was a good room but the bathroom was in the hallway. Not a public bathroom, the private one of the room. Is really far from the central piazza, I recommend to take a bus. The lady in the desk was not nice. But for just one night it was a good place. Overall our stay here was lovely! The staff were extremely helpful and recommended lots of things for us to do and see along with lovely local food spots. The room itself was great however the bathroom could do with updating as was very small however for the price, this is very reasonable. There was not easy to adjust the hot water for taking shower. There was not any secure room for guests' luggage before checking in and after checking out. One of the staff was very unfreindly and disrespectful but not all of them. Just kind of run down. Beds were hard and uncomfortable. Weird smell. Too far from city center. Not worth how much we paid.